Sometimes you need the comfort of a good, warm, creamy Mac ‘n Cheese, but with an adult flair. 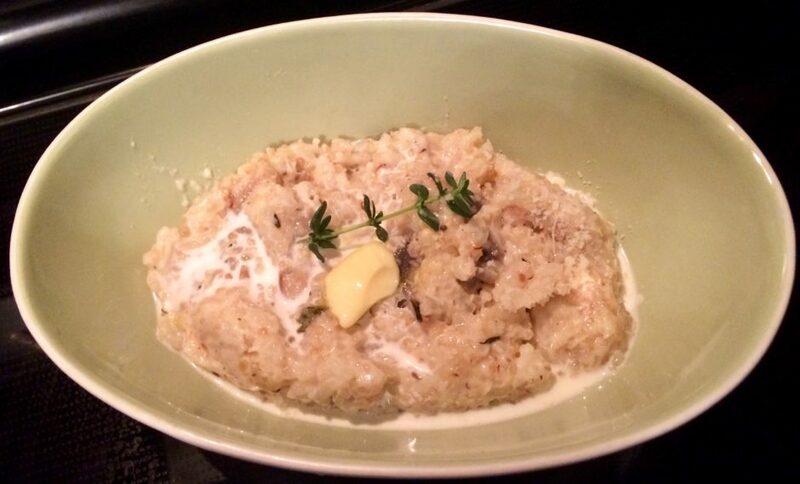 My creamy Mushroom Risotto with white wine and parmesan fits the bill. And it was SO easy! I started mine on the stove top — and you can complete it here — too. But I popped my mixture into an electric pressure cooker for 8 speedy minutes and … voila! Creamy, mushroom risotto as comforting as any mac ‘n cheese, but with a grown-up taste. All the measures below were actually estimated by me. This is pretty forgiving! To this, I added 3/4 cup of chopped mushrooms. Then I added a 1/2 cube of chicken or vegetable stock. Sautée on medium high until the rice begins to turn whiteish and your mushrooms soften, about 2 – 3 minutes. I put the mixture in a pressure cooker and added 3/4 cup of white wine, 3/4 a cup of water. To be honest, I eye-balled the liquids to about 1-1/2 cups.If you are doing this on the stovetop, just add your liquid to your pot, cover and steam on medium low for about 17 minutes. Into the pressure cooker, I added a few whole, fresh sprigs of fresh thyme (or 1 tsp of dry thyme). When you release the pressure, stir in 1/4 cup of cream, a few dots of butter, salt and pepper to taste, and top with few tablespoons of grated parmesan cheese. Spinach is a funny vegetable. Kids and adults can claim to love it or loathe it, but for me, almost anyone will love it if it’s prepared in a tasty way. When my son’s girlfriend, Sabrina, a self-proclaimed disliker of the green stuff, ordered and then devoured yummy, warm and cheesy spinach appetizer at a local restaurant, I put my mind to creating a spinach dish that would be just as tasty, but healthier. Not every mom is as lucky as I am when it comes to kids and vegetables, especially spinach. William eats just about anything, but when he was little, I didn’t know if this would hold when it came to something like spinach. So I would prepare what we simply called “green noodles” as my way of adding this healthy vegetable to his diet. 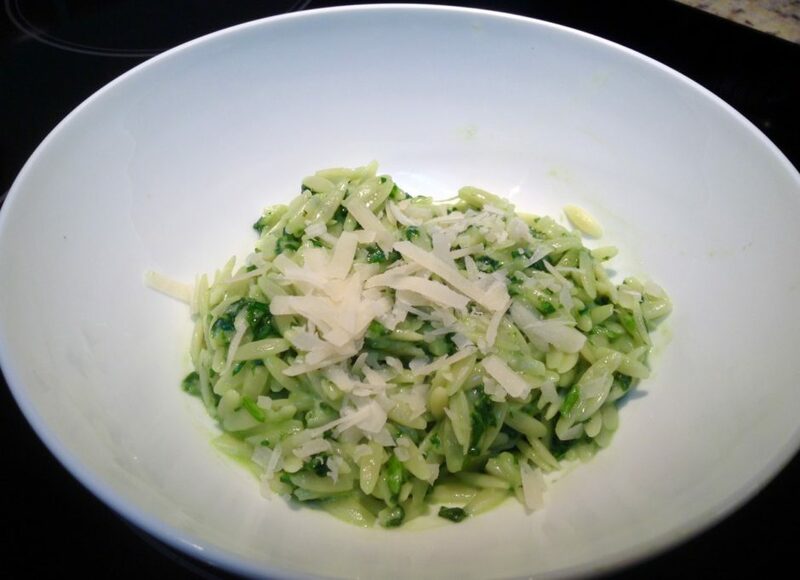 The recipe below blends my “green noodles” idea with the comfort of the creamy, warm and cheesy restaurant dip. So it’s not just for kids. It’s super as a side dish but also filling enough to eat on its own. The bonus is that it serves up the warm comfort feeling of something like Mac & Cheese, but definitely healthier! Here is how I prepare spinach for even the most finicky guest or visiting child. Oh! And if you like gooey, creamy, hot spinach dips, you and your guests will devour this comforting and tasty side dish. Finely mince, and I do mean mince, two cups of lovely, tender baby spinach (or one cup per person) until the leaves are teeny tiny. Do not cook. Just set the pile aside on the chopping board. Boil the right amount of tiny pasta until done. I measure out about 1/2 a cup, dry, per person. For the pasta here, I used Orzo, but you can also use little stars, or other really small pastas. I do not recommend larger noodles and wouldn’t suggest any thing bigger than an elbow macaroni. Drain pasta and return to the hot pan it was boiled in. Immediately add 3 tablespoons of good butter so it will melt into the pasta. Toss in all the uncooked, minced spinach. Add 1/4 fresh, grated parmesan cheese. Add 1/4 sour cream or creme fraische. Stir until the butter, parmesan and sour cream are well combined. 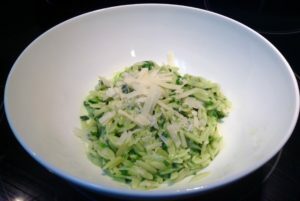 Top with fresh, grated parmesan. TIP: If you eat gluten-free, simply substitute wheat pasta for a Quinoa or Rice pasta. I often feel that if I eat vegetarian or vegan, I’m going to be left wanting. I have nothing against the raw food champions, but me? I like my food warm and creamy. 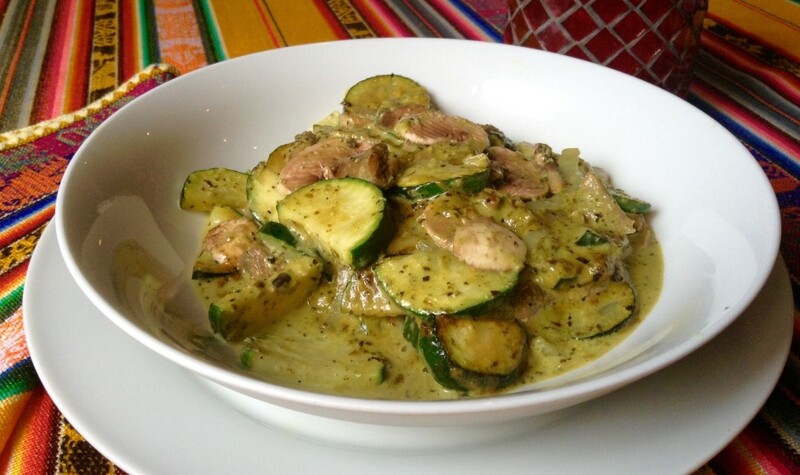 This dish not only fills the comfort-food bill, it fills you up and it does so without dairy or meat. It’s vegetarian healthy (vegan if you use a pesto that does not include Parmesian). Serve up a large bowl for lunch, or serve it as a side dish to a main course. Lace the bottom of a your favorite frying or sauté pan with 1-2 tbsp. coconut oil (or substitute cold-pressed, extra virgin olive oil, or half & half, mixing the oils), and heat. 2 Cups sliced zucchini (I cut half-moons to match the mushroom shapes). Sauté together until the mushrooms are soft, but not limp, and the zuchini is softening, but not going clear. You want it to hold a little firmness. Add 3 tbsp of your favorite home-made or jarred Pesto (vegans, you will want to use a pesto that huses a substitute for the Parmesian cheese or incorporates extra nuts and basil). Stir together until hot and then… add the juice of 1/2 a lemon. This is going to really give the dish some zing and bring out the flavors. Vegetarians and meat-eaters, top with grated Parmesian. Vegans, opt out of the cheese and top with toasted nuts.